Three brothers. One mafia curse. Ben Frank has blood on his hands. He knows that he has killed a man in a bar-room brawl. He knows that as an Italian immigrant in turn-of-the-century New York, life is tough. But what he doesn’t know is that the victim’s father, a Mafia boss, will settle a curse, a ‘maledizione’, on Frank’s family; that the shoemaker’s three sons will each die in their forty-second year. 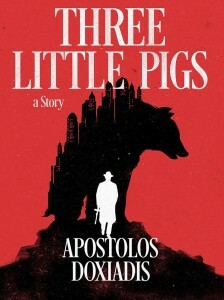 Following the varying fortunes of the shoemaker’s sons – Al, Nick and Leo Frank – as well as their nemesis, a gangster by the name of ‘Terranova’, Three Little Pigs grows into a dazzling meditation on chance, destiny, choice and their consequences. At once a gripping thriller and an investigation of character and fate, this is a revenge tragedy written by a master at the very peak of his powers. Can the brothers beat the curse? From Apostolos Doxiadis, author of Logicomix, comes a unique and completely absorbing crime novel, sure to appeal to fans of Mario Puzo, Don DeLillo and Carl Hiaasen.